"Going to Derby College has helped inspire me. Unlike sixth form college you’re encouraged to take more responsibility for yourself." 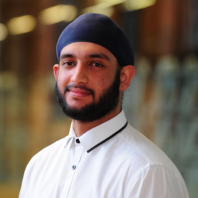 Derby College student Sukhveer Singh Dhadwal is planning to study for a business degree abroad after successfully completing his Level 3 Advanced Extended Diploma in Business. Sukhveer, who is 19 and from Littleover, would very much like to take his degree at a university in the USA or Canada – and believes that going to Derby College, has given him the impetus to pursue his career goals. Sukhveer’s main ambition is to be his own boss, which is why, after gaining A levels in psychology, chemistry, biology and geology at sixth form college, he went on to study business. He said: “Going to Derby College has helped inspire me. Unlike sixth form college you’re encouraged to take more responsibility for yourself. Sukhveer, who got the idea of studying overseas after visiting Miami University last year, is considering applying to universities in California and possibly the University of Alberta in Canada. He is unsure exactly which subject he would like to take, but is keen to gain a degree relevant to business such as accountancy or economics. Ultimately he would like to start his own business in the States or Canada in a tech-related field such as gadgets. Find out about studying Business Studies at Derby College.